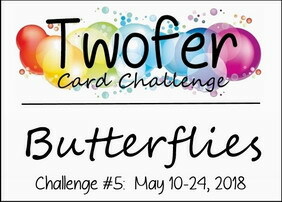 Time to play in Darnell's Twofer Card Challenge #5 - Butterflies. This challenge is thoroughly enjoyable ... making two cards for one challenge. The cards presented are in the Birthday and Get Well categories. The common element is the solid butterfly die cut from MFT Fancy Butterflies. Card 1 - Happiest of Birthdays. The butterfly was cut from a watercolor panel spritzed with water and color shine and half of it was adorned with gear die-cuts cut from the same watercolor panel and embellishments randomly placed for a mixed media look. A gear and enamel heart embellishment were adhered to the center. The butterfly was attached to an embossed wood-grain panel then adhered to the larger stitched rectangle panel. A simple birthday sentiment finished the card. Card 2 - sending get well wishes. The butterfly was cut from a Distress Oxide Ink blended panel. The companion to the solid die-cut butterfly was cut from vellum. A few gemstones in the colors of the solid panel were attached to the spine. The butterfly was attached to a framed panel with an embossed inset using the MFT Grosgrain Texture Board. A simple sentiment completes the card. Two beautiful, distinct cards, Marilyn! I adore the mixed media take on the birthday card. It really is a stunner, with so many bits & pieces and details and yet maintains an overall CAS design! Absolutely fabulous! Gorgeous cards Marilyn! How creative to add gears to your butterfly wing, yet your whole card still stays so CAS, I'm pinning it for future inspirations to mix 2 opposite elements together! Thanks for this wonderful example of Clean and Spectacular cards! Hugs, Gwendolyn P.S Thanks for popping over and leaving me a little butterfly kiss on my blog!